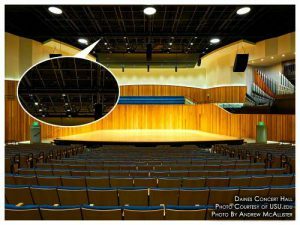 Back in 2016, install completed on the SkyDeck™ system designed and installed by IASI for Utah State University’s Caine College of the Arts’ concert hall. The system extended over the entire FOH and sized at over 2000 square-feet. 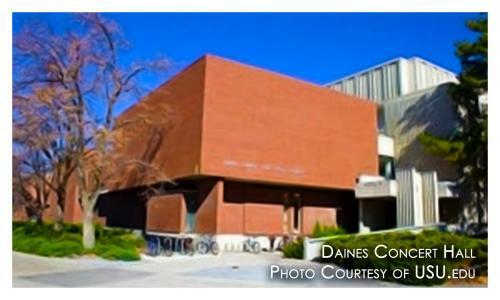 With the grand opening, USU unveiled their renaming of the concert hall from Kent Concert Hall to the Newel + Jean Daines Concert Hall. The fabulous facility was designed by architects Soprano + Mooney. The hall seats over 1,700 people and has a stage which extends 72’ wide by 27’10” deep with a 21’ opening. Part of the larger Daryl Chase Fine Arts Center renovation, USU has recently finished work for the entire project surrounding the concert hall. Its grand opening coincided with the 50-year anniversary of the Complex. The opening consisted of a gala featuring Tony Award-winning Broadway actress Kelli O’Hara, pianist Kurt Bestor, the American Festival Chorus & Orchestra and students and faculty of the USU Department of Music. The gala is held in what is referred to as the “crown jewel” of the building, the Newel and Jean Daines Concert Hall. Besides the Daines Concert Hall, additional building renovations include the Morgan Theatre, Tippetts Galleries, Ron and Janet Jibson Family Courtyard, Impact Commons, Hansen Atrium and the Sid G. Perkes Theatrical Design Complex. For those interested in supporting the Caine College of the Arts, the school is running a Name a Seat campaign. You will receive a commemorative certificate listing the name and seat number for each purchase. Any seat donations will not go toward the building project. All proceeds will be used to establish an endowment to support the students and programs of the Caine College of the Arts.